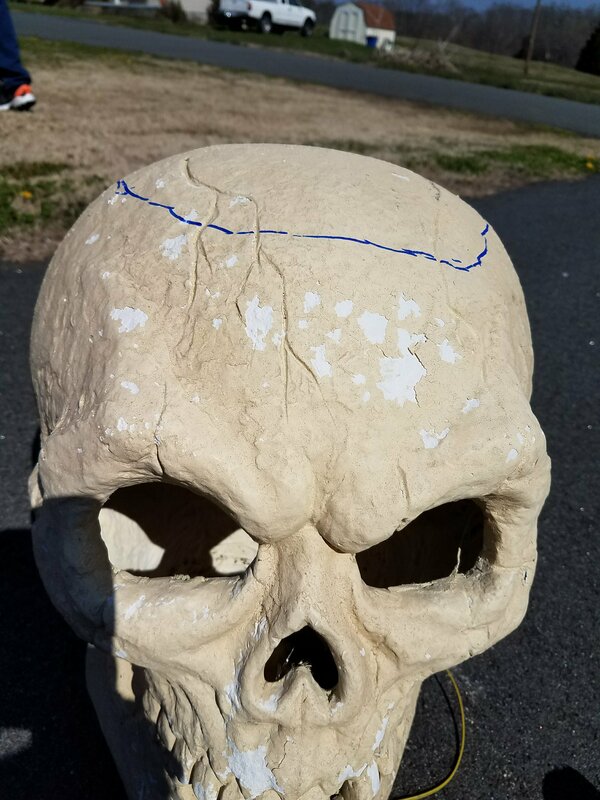 I bought a huge Halloweeb skull years ago at Kmart. It was hollow on the inside and lit up. 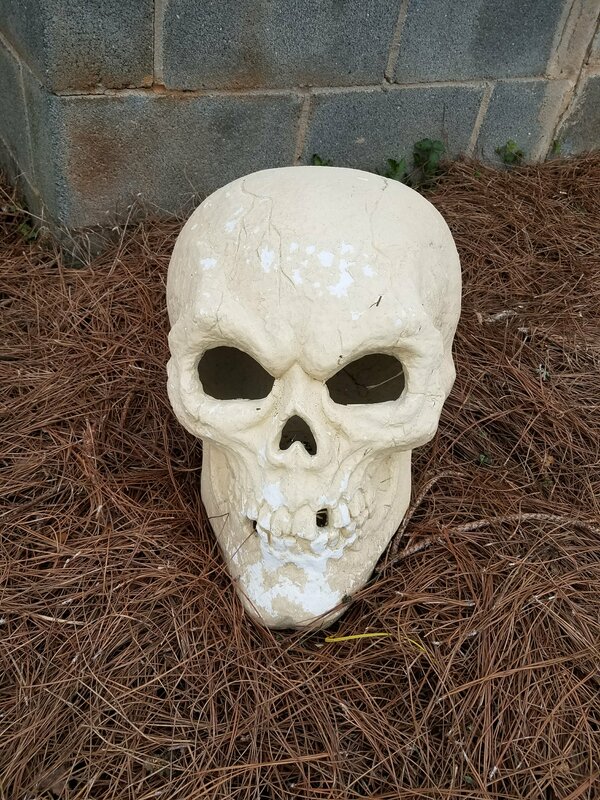 The skull has been hanging out in my yard for years. 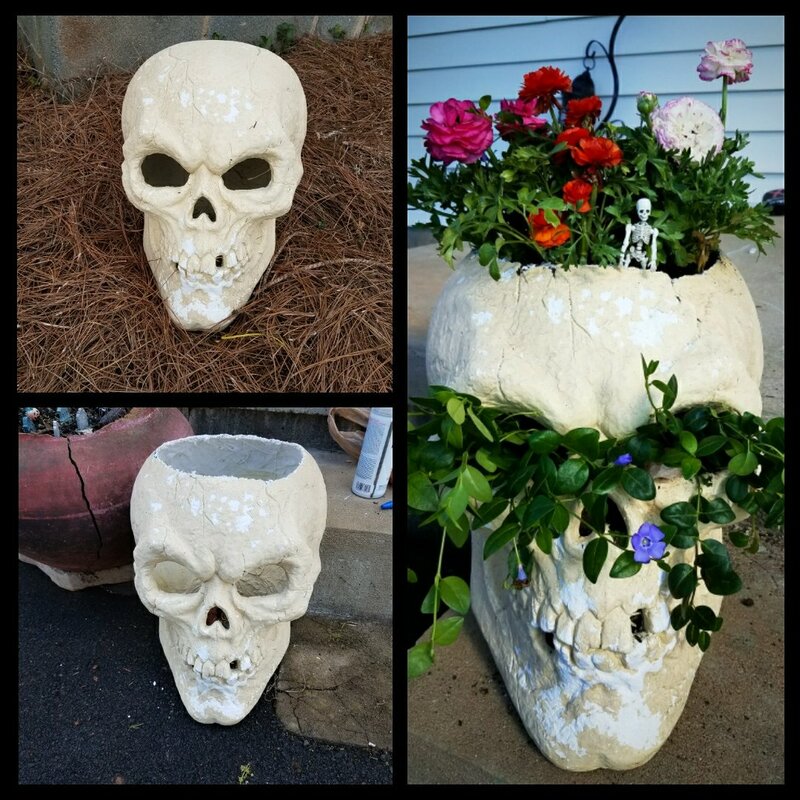 Yes, I keep skulls and skeletons out in my yard year round. The light in the skull quit working year two. 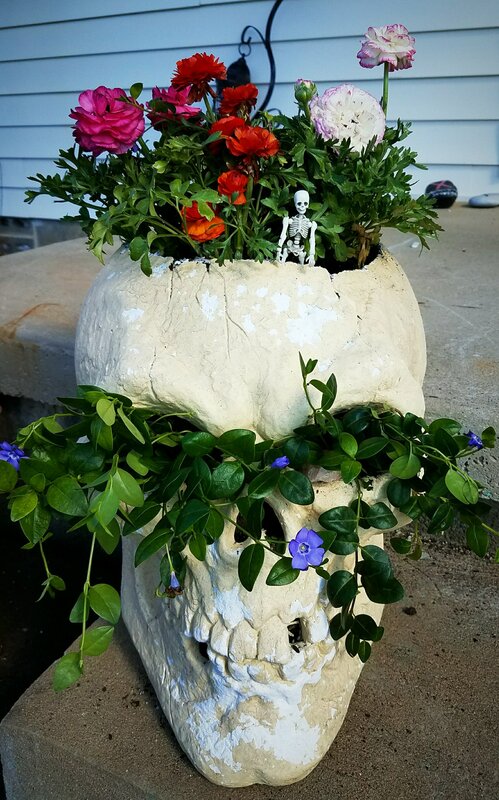 I have been wanting to turn it into a container for plants for a few years now. Finally I got around to doing it. 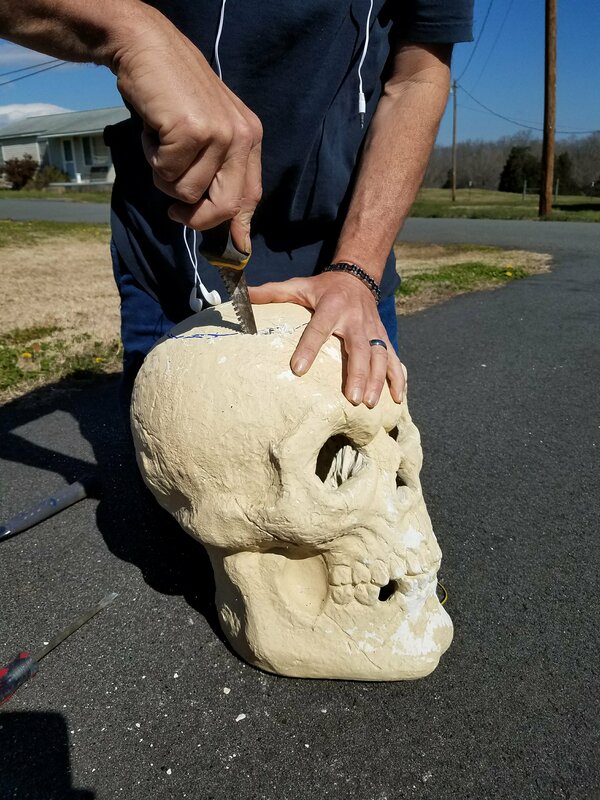 Saturday I asked my husband what I would need to remove the top of the skull. I planned on removing it myself, honestly. Husband said draw what you want removed. I did and he proceeded to do the cutting. I sat back and supervised. Now if you notice in one of the photos below my drawn circle looks jabberwocky. It’s intentional. Okay it wasn’t I have no clue what the hell happened. Turned out okay in the end. 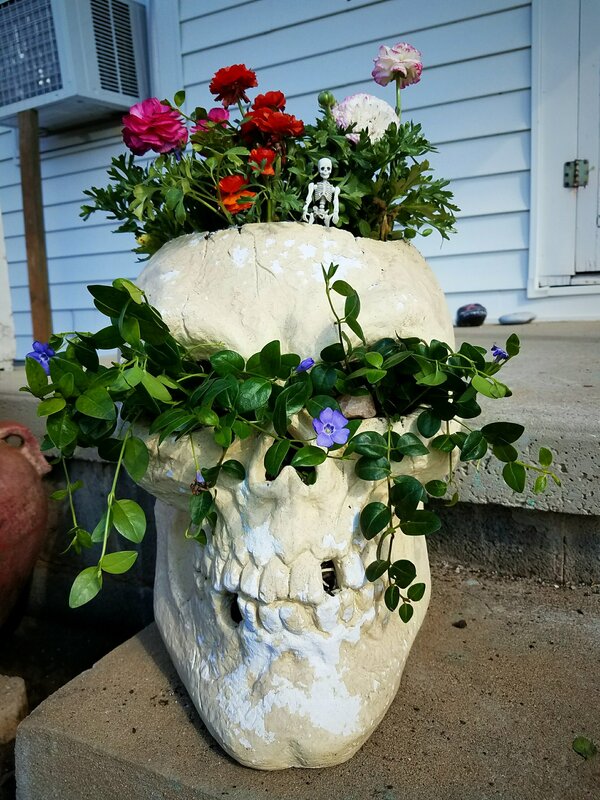 Once my skull had been opened I put some rocks and yard junk into bottom. 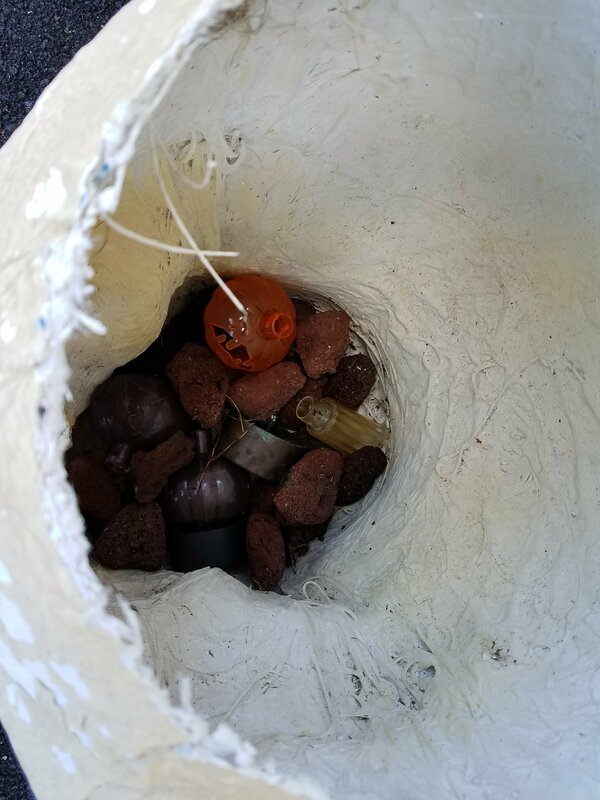 When filling any container garden I add a layer of rock to bottom. Then plastic bottles or junk, just to fill space. A container full of only dirt is HEAVY. This helps lighten the load. I added some dirt up to where the eye sockets began. I tucked some Vince Periwinkle through holes then added more dirt. I added some colorful annuals to the top. Done. Once the annuals quit blooming or I find plants I like better it should be easy to switch the plants out. It’s been a few weeks since my last post. A lot has happened. I became a Grim-maw! Little Miss K was born March 30th. An amazing experience for us all. So since it’s baby time at my house of evil. I had to make some baby stuff. Goth style. I saw some of these items on Pinterest. Each one had several different versions and tutorials. I did not really care for any of them. The designs were simple so I made up my own patterns. The first thing I made was burp cloths. A burp cloth is a simple design, it is something you throw over your shoulder when you burp the baby, it will catch any spit up. Very simple project. Great for anyone just getting into sewing. You need 2 fabrics cut 9×19 inches. One fabric is your design piece so any lightweight cotton fabric will work. The other fabric should be an absorbent material. I used terry cloth for some burp cloths and cloth diapers for the others. Lay out your two pieces right sides (printed sides) facing in. Pin together. Sew around leaving a 4 to 6 inch area not sewn. Turn right side out and iron. I used a zigzag stitch to sew around burp cloth. Done. Next project was a bib. I made two styles. Your basic and a bandana bib. You can find the patterns on Pinterest. They’re many to chose from. This is another beginner project. Cut out pieces, sew right sides together leaving a gap open to turn right side out. Iron than zigzag stitch around. I did not zigzag stitch around neck area, well I did the first one and to me it felt like it would be irritating to a newborn neck. Sew on some Velcro for closures and you are done. Third project was a bit more involved but still somewhat easy. I call it a diaper change station. It’s for on the go diaper changing, gives you a clean area to change your baby/evil spawn/mini me or whatever you call your offspring. Here is a picture of it completed. I will give more detailed instructions a few blogs down the road. I am in the process of making a baby kimono shirt with skulls! Pictures coming soon. Speaking of babies. 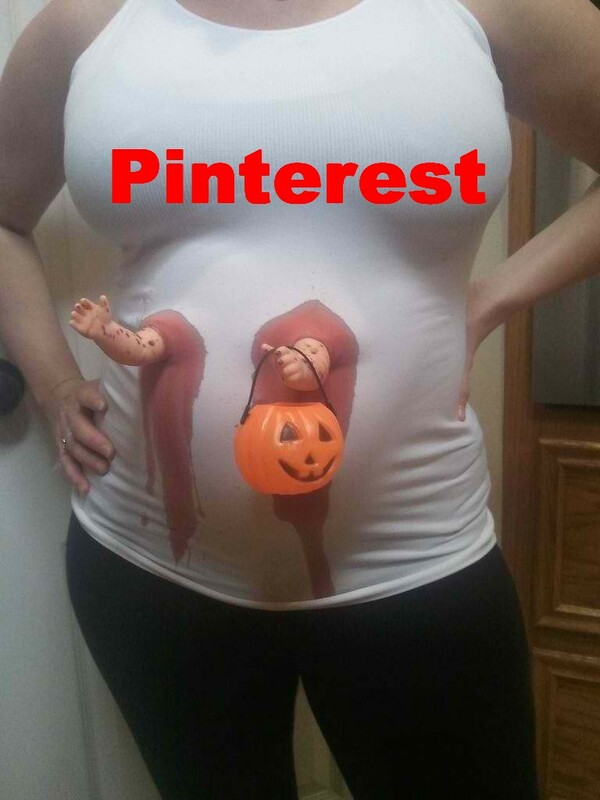 Saw this on Pinterest before Halloween and made this for a co-workers Halloween costume. Many people loved it but others said we went to far. 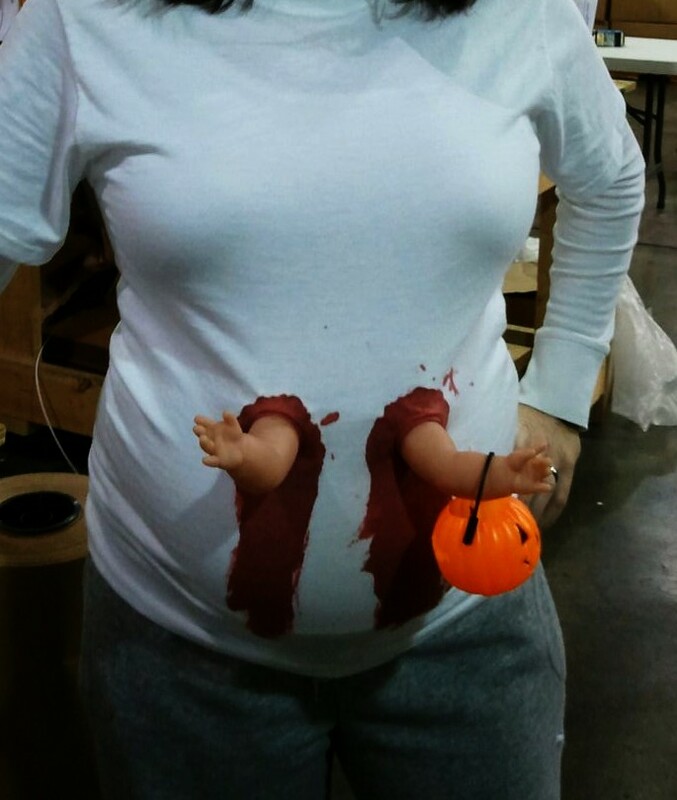 Can you really go to far with Halloween? I don’t think so. On Pinterest there was only a picture with no link to instructions so I had to figure it out myself. Surprisingly it turned out right the first time. No magic or virgin sacrifice needed. Disappointing I know. I would have done it if need be though.